Teen Amateur Of The Week: JeanPaul Larmony Wrestles With Weights! JeanPaul gave up a promising wresting career after injuring his knee and was drawn into the weightroom. 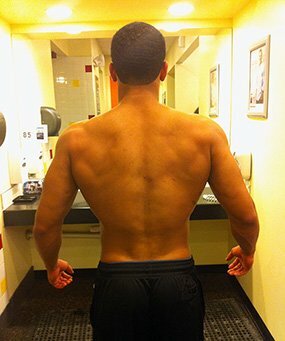 Get the plans this teen uses to build monster muscle! I started playing sports at a young age and exercised in the offseason to stay in shape. I eventually wrestled in high school and it quickly consumed me. I made varsity, most-improved wrestler, and co-captain. I reached my wrestling peak in high school, suffered a severe knee injury, and everything came crashing down. After coming to my senses, I finally met with an athletic trainer and doctor who delivered news I refused to believe. After fighting through my injury for three months and refusing to sit out, I shattered my patellar tendon in my right knee and slightly tore my ACL. I went through a complex surgery and received news that I might not be able to partake in physical activity again. After surgery, I was on bed rest for months and missed a school year. Home school was horrible. Being dormant wasn&apos;t for me. The pain was horrible even with the medication and endless physical therapy. I eventually improved after what felt like two lifetimes and was cleared to move again. I lost lots of weight and my left leg was stronger because I lugged a metal brace around for so long, which made my legs disproportionate. I was disappointed with my physical image and my spirits were low. Until then, I only went to the gym for sport purposes but never tried to build muscle and focus on fitness. I signed up for the gym soon after and became addicted. "I enjoyed lifting more than anything and left the gym every day wanting to come back." After working out regularly, I researched about fitness, stumbled onto bodybuilding, and decided to give it a shot. I enjoyed lifting more than anything and left the gym every day wanting to come back. I wanted to be the best and drilled it into my mind for motivation to keep me going. I was motivated by Dwayne "The Rock" Johnson when my bodybuilding journey started. His persona taught me to improve my dedication and humbleness. I&apos;m also inspired by CT Fletcher and Mike Rashid. Their lifting style improved my results dramatically and complemented my competitive spirit. When I felt down, I reminded myself why I started and why it&apos;s important to never give up. My personality helped a lot. Participating in sports helped me stay focused, on task, and trained me to act on instinct. I view bodybuilding the same way. "I want to help people pursue their fitness dreams as I continue to pursue mine." I plan to inspire others through what I&apos;ve done and continue to do. I want to help people pursue their fitness dreams as I continue to pursue mine. I haven&apos;t regretted a second of the time I spent working out. I want to enter as many competitions as possible so I can pick up tips and insight from fellow bodybuilders to improve myself. The most important factor to remember aside from dedication is eating correctly. Eat according to your fitness goals. If you don&apos;t eat right, your hard work in the gym will be for nothing. My favorite competitor is Guy Cisternino. Watching his rise and accomplishments helped me stay on track as I followed his workouts and dieting routine. He progressed through the bodybuilding community quickly with his incredible build and massive legs. He&apos;s a great motivator and bodybuilder with a great spirit. His insight gave me lots of gains and great results. I practically live on Bodybuilding.com! I made a BodySpace account first and viewed the articles for advice and insight. Their amazing supplement stacks are priced great and have good reviews. Bodybuilding.com is helpful no matter what you&apos;re looking for.